Transatlantic voyages can be dull and uneventful affairs, but the crew on board the 55 metre Amels superyacht Gene Machine had a trip to remember after rescuing the sailing yacht Minerva. Captain Fraser Gow and his crew responded to a distress call after the 13.4 metre Bavaria sailing yacht suffered a failed forestay leading to a dismasting during the Atlantic Rally for Cruisers. Speaking to our sister publication Dockwalk, he explained: “Other yachts participating in the rally were kind enough to offer whatever diesel they could spare in order to keep Minerva motoring towards the Caribbean; however, it soon became clear that they would not have enough to make it.” And with a total fuel capacity of 115,000 litres, Gene Machine was well placed to come to the rescue. The situation became potentially life threatening when the sailing yacht’s watermaker also failed, leaving the crew with a limited supply of drinking water. It was at this point that Captain Gow stepped in and arranged a rendezvous point roughly 1,200 nautical miles off of Antigua. Three of the five crew members on board Minerva were rescued immediately, with the final two crew only boarding Gene Machine once the sailing yacht was securely attached and could be towed to safety. The two vessels arrived into Antigua this morning (December 12). 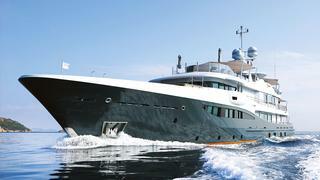 Launched by Dutch yard Amels in 2013, Gene Machine features accommodation for ten guests and 16 crew. Despite the unplanned detour, the crew still completed a sponsored 4,736 mile cycle in the sundeck superyacht gym to raise money for charity. This arduous stretch matches the total distance between the yacht’s departure port of Gibraltar and eventual destination, St Maarten.